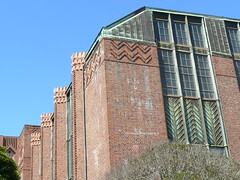 In 1928 San Francisco architects, Miller and Pflueger, won the bid to bid a new building for the Roosevelt Junior High School. 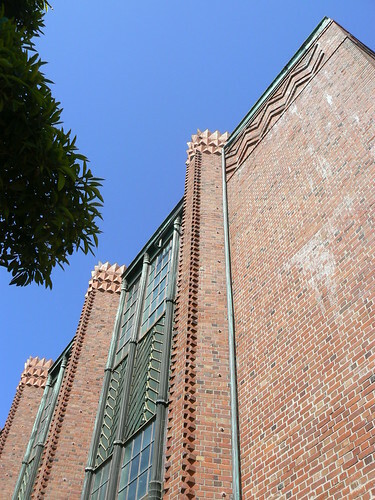 They choose to build the school using brick, a rare choice after the 1906 earthquake, and were probably influenced by the Dutch Expressionist buildings and the Dutch Pavilion at the 1925 Paris Exposition. 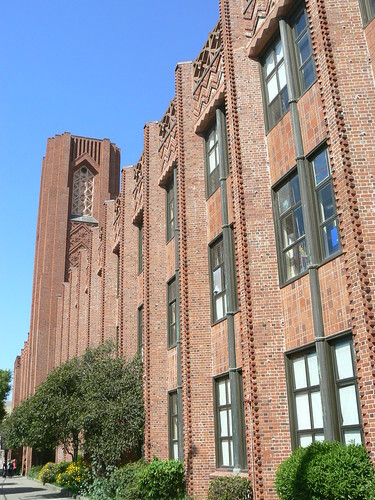 The building opened in August 1930 and as the Roosevelt Middle School is still used for education today. What an excellent building, and you have done a great job at capturing it's qualities, I especially love the last photograph in your series, looking up like that has given a great dramatic angle and the brick work is simply stunning! Very different from what we normally see in Australia. Well done! 1. 1925 was as early as it gets for Deco fairs, so Miller and Pflueger must have gone over to Paris themselves OR had seen publications about the exposition that were quickly written up. 2. The Netherlands isn't usually thought of as a major influence on North America. Miller and Pflueger must have simply loved the Dutch pavilion. Thanks Thomas,do you know the BYFAS building in Abbotsford, here in Melbourne? It has similar brickwork on the tower at the entrance. Helen, this site has some pictures of the Dutch Pavilion from the Paris 1925 Exposition. I think the brickwork on the back wall is extrodinary. 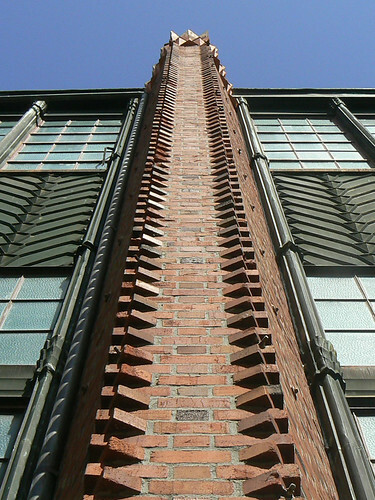 Art, a curious bit of European brickwork in California! Thanks. Looks like a very comprehensive site.